Band will ask fans to “give it away, give it away, give it away, give it away now” at the Feb. 5 fundraiser in L.A. 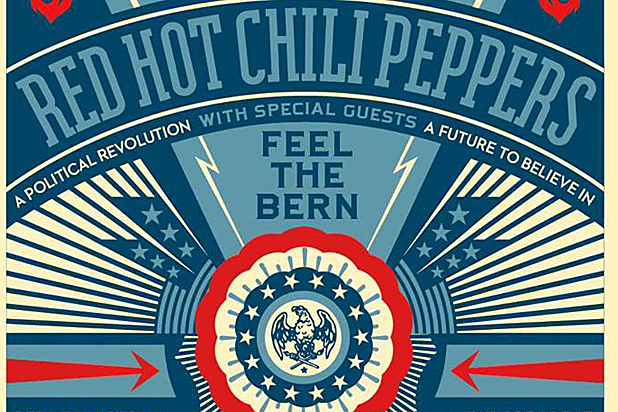 The Red Hot Chili Peppers are set to play a concert to benefit the presidential campaign of Bernie Sanders next month. The show, featuring the band members Anthony Kiedis, Flea, Chad Smith and Josh Klinghoffer, will be held on Feb. 5 at the Theatre at the Ace Hotel in downtown Los Angeles, according to the band’s Twitter and Facebook posts. The seven-time Grammy-winning act said that they’ll take the stage at the 8 p.m. and doors open at 6:30 p.m. Fans and donors really can expect to “give it away, give it away, give it away, give it away now,” in a bid to get Sanders to the White House. Tickets for the fundraiser range from $500 to $2,000, and higher-priced seats include a meet-and-greet with the band and a signed commemorative poster from artist Shepard Fairey, the man behind President Obama’s famous “Hope” poster. The Rock and Roll Hall of Famers are hardly the Vermont Senator’s only Hollywood supporters. Will Ferrell, Susan Sarandon, Danny DeVito, Mark Ruffalo and Sarah Silverman — who hosted her own comedy fundraiser for the candidate Tuesday night — have also jumped on the populist Democrat’s bandwagon.